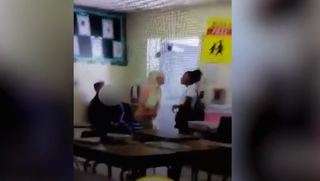 One North Carolina mom is furious after seeing video of a Cotswald Elementary School teacher hitting her 11-year-old daughter with a Swiffer broom. “You cannot be a teacher and be able to teach children if you can lose your cool in a manner where you hurt someone else’s child,” the outraged mom, Tiffany Fields, told Fox 46. The video was captured on Snapchat by another student in the classroom, according to the report. Fields says that about two weeks ago she was called into the principal’s office to discuss an incident that occurred between her daughter and another student. “I was told a child hit my child with a broom, and that my child hit the child back with a broom. Kid things. And some minor altercation between children,” Fields said. But somehow, the video eventually made its way to social media and apparently tells a very different story. “But the video I saw was the total opposite, it was a teacher losing control of herself and hitting a child in the head with a broom and lunging at her twice, forcing her into a wall,” Fields said. Fields posted the video to Facebook over the weekend and then called the school, demanding an explanation. On Tuesday morning she was called into another meeting with school officials and a police officer. Fields said that in the meeting, the officer made it seem as if the incident was her daughter’s fault. “You haven’t even talked to her yet and you’ve already tainted the whole investigation by letting me know that you believe these statements before even talking to my child,” she said. Fields said she believes that, regardless of what occurred in the classroom, the teacher was out of line for the actions she took against Fields’ child. The district is looking into the matter. As with all safety matters, school administrators would investigate to gain an accurate understanding and resolution to the matter. The incident was reported on May 16, at which time the school looked into the matter by reviewing school videotape, nothing was found to substantiate the allegation of an assault. This week a second videotape surfaced, which led the parent to contact CMS-PD to complete a police report. That process is underway.